A Foreign Land : Hooray! Okay, so this is me slinging a little truth your way. I feel a bit zapped after all the Summer Fashion Week festivities. Doesn't seem like I'm quite “in shape” to post 7 days a week. So, today I've been taking it a little easy. Of course, just because I'm tired doesn’t mean there isn’t cause to celebrate! Kelly over at Kelly Leigh Gets Busy was kind enough to tag me with a blog award recently. Now I get to tell you guys 7 things about myself that you don’t already know. Hmmm. I'm going to tweak that a little – probably because I'm so versatile. (?!?!??) See, A Foreign Land was a semi-hidden blog for a long time. I’ve already written about things but a lot of you weren’t around to read what I was saying. Therefore you don’t know. Right? Well, here are those posts again so you can catch up! See, I told you I was taking it a little easy. Seven Posts About Me… That you may not have read. 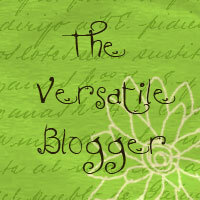 I'm planning to hand out my own bunch of Versatile Blogger awards to some of my other new bloggy friends in the near future. And for now, many, MANY thanks to Kelly for this sweet recognition!